Are you after the best car ramp reviews you can find? Look no further! 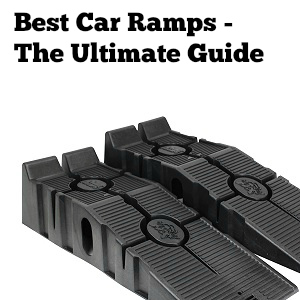 After over a hundred hours of testing and research, we have compiled the largest and most informative car ramp and car chock review you will find anywhere. 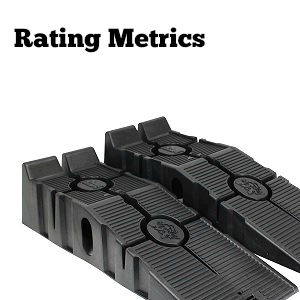 In this review, we list all of the top car ramp companies and analyze our top choices based on 5 essential metrics: Performance, Build Quality, Ease of Use, Price, and Overall Rating. We also discuss what to look for in car ramps as well as the difference between car ramps, car chocks, and loading ramps. For your convenience, we have listed the top picks in the table below. To read the more thorough review, just hop right under the table. Overwhelmed by the sheer number of car ramps and car chocks to choose from? No need to stress! We have done all of the research for you and found some of the best brands you should look for. We break down each below in a short summary. ATD is short for “Advanced Tool Design” and they have a single example of a wheel ramp for sale that we can find. The product is extremely strong and capable of handling just about anything you can throw at it, thanks to its impressive 20 ton rating. However, it does come with a high asking price and significant size and weight considerations. Beacon (or rather Beacon World Class Products in its long form) makes a variety of premium-level tools and parts that are heavily geared towards industrial and commercial applications. True to form, their lineup of car ramps are geared towards those with larger vehicles such as tractor trailers. They also offer up a few different examples of autoloaders which are intended on assisting in loaded items into the back of a truck. Their products, while definitely of high quality, aren’t cheap. Black Widow is rather unique in that most of their car ramps aren’t exactly ramps but rather powered lift tables for ATVs and motorcycles. Those are a review in of themselves (maybe in the future!) but for this one we will be focusing on their car ramp. While they only seem to offer the one, it does stand out from the crowd with its aggressive tread, high load rating, and unique overall look. Asking prices aren’t bad, either. When it comes to car parts and car accessories, Buyer’s Products is among the largest in regards to the selection of items that they offer. They sell just about everything you could think of that is related to automobiles and they do so at very reasonable prices. In regards to their car ramps, they don’t really focus on car ramps but rather car chocks. In fact, their car chock selection is huge and spans many different shapes and sizes. While very affordable, they are a bit lacking for those after standard car ramps that can fully elevate a car, though. Camco has a host of automobile and industrial supply products. In regards to their offerings of car ramps, they focus primarily on car chocks as opposed to standard ramps. 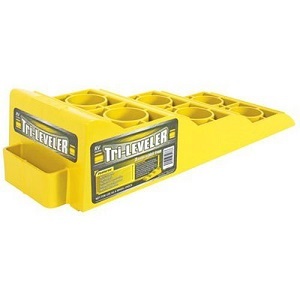 They have quite a variety of sizes, including tri-leveler chocks and tandem chocks. For those after traditional car ramps you may want to shop around but for those who are after or content with car chocks you will be happy with the selection. Also, prices are very competitive. DEDC works with various car-related products for both the interior and exterior of your vehicle. Their car chock/car ramp selection is rather lacking with their sole product being a set of heavy duty wheel chocks. 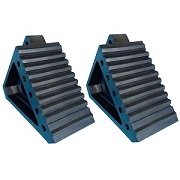 The price point is a bit higher than other chocks on the market but they are of higher quality and intended for more challenging applications. As the name suggests, Discount Ramps offers all sorts of ramps, ranging from typical car ramps and car chocks to loading ramps and even BMX bike ramps! With such a diverse selection of ramps to choose from it is safe to assume that Discount Ramps has a good grasp on what is needed to make a quality product. 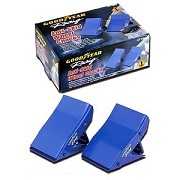 They offer products in both plastic and metal configurations and they also have a small batch of car chocks to go along with their ramp selection as well. Prices are a bit higher here (we assume because of the somewhat stored Discount Ramps name). Electriduct sells a lot of things but we have noticed they mostly appear to focus on electrical components and tools and hardware. They do offer quite a few ramps and similar products but they are more geared towards protecting electrical wires and cables. However, they do offer a car chock that is intended for vehicle use. Their product is a bit unique in that it is made of hard plastic instead of molded rubber or metal which is the norm from what we have seen. Ernst Manufacturing offers several different lineups of product lines including various car accessories. 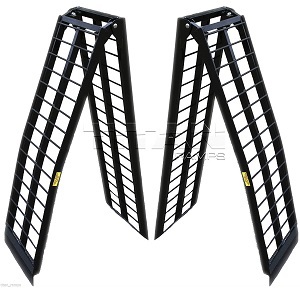 In regards to their car ramps, they offer a single car chock that is quite popular in online markets. It is intended for casual to moderate users and those that are after something more powerful and capable will be out of luck. In addition, since it is a car chock it won’t have the capability of lifting your car off the ground for maintenance underneath. However, the asking price is quite reasonable and build quality is fine. When you think of Goodyear you likely first associate them with the tires that many of us have on our cars. However, Goodyear also makes quite a few other automobile-related items (and beyond!) including a somewhat unique set of wheel chocks. They are actually made of metal and have the ability to be folded which not only increases their versatility but also allows for easier storage. Asking prices are very reasonable as well but you are obviously limited in your product choices. Hopkins is another online distributor that sells a whole host of items in various categories. Similar to many other companies like this, their approach seems to be importing mass-produced items from the Eastern Hemisphere and selling them at very competitive rates. Their broad scope and budget-minded approach are evident as their only product in this category is a pair of what they call heavy duty wheel chocks. House Deals sells things in all sorts of categories. Surprisingly, they have a pretty nice and original lineup of car ramps while not offering anything in terms of car chocks that we have found (usually it is the other way around). Specifically, they cover car ramps in both rubber/foam and metal and even a car ramp that takes advantage of hydraulics. These special car ramps aren’t cheap, however, and most fall well into the premium price category. Husky is yet another brand that has their fingers in a lot of different product lines. 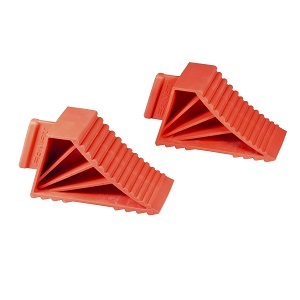 Their small lineup of car chocks all come in a very vivid orange color and they hope that their simplicity and low costs will win over potential customers. You won’t find anything groundbreaking with Husky car chocks but if you are on a super tight budget then they will obviously spark your interest. Larin doesn’t really deal in conventional car ramps exactly but rather in cargo carrier and ATV to truck ramps. 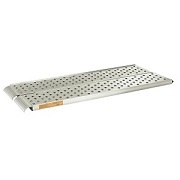 The ramps that they do offer are of very high quality and made of high-end metal but do cost quite a bit of money and require a bit of initial setup. But for those after this specific type of ramp, they are definitely worth looking into. Lund’s shining point here is in their enormous range of loading-type of car ramps. These ramps are designed to load items into the bed of a truck, trailer, or into an elevated loading door. All of their products come in high-quality metal materials vary greatly in length, width, and even load rating. The asking prices are high but about what you would expect for this type of product. As their name suggests, MaxxHaul really puts a lot of emphasis on making products centered on hauling goods. Of course, a vital aspect of hauling something is finding a way to load it which is where their loading ramps come into play. Similar to some other brands we have reviewed on here, these products aren’t really car ramps or car chocks in the practical sense but rather ramps that are designed to load items and even some smaller vehicles like ATVs. They seem to find a happy medium between quality and asking price. Omega’s small but potent lineup of car ramps is targeted towards those after the absolute best in regards to weight capacity. Their industrial-grade car ramps are heavily reinforced and can handle just about anything you can throw at them, including many full-sized tractor trailers and heavy farm trucks. To achieve this, their asking prices are extremely high and likely some of the most expensive you will come across but that is a price you have to pay for this level of performance. OTC is another of the relatively few brands we have come across that focus primarily on industrial and commercial applications with their small lineup for car ramps. 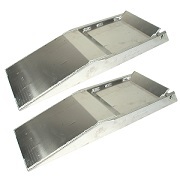 These ramps are extremely powerful and have some of the highest load ratings in the industry. This, as you might expect, does come with having a very high asking price but for those that can swing it you shouldn’t be disappointed in what you get. As the name suggests, Performance Tool makes tools for all sorts of applications. In regards to their car chocks, they have two models that we have come across. Both are very similar and approach their application in a very similar way, with the main difference being that one is rubber and the other is plastic. It appears Performance Tool is interested in making simple and low-cost models for non-commercial applications. Pit-Pal is definitely one of the more unique companies that we have reviewed. 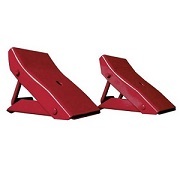 They sell a huge selection of car ramps and also have a few car chocks as well. What makes them stand out is that nearly all of their products are made of metal, specifically coming in aluminum. They are also hollower than many other metal car ramps on the market which greatly helps in reducing weight but also lowers the load rating. Asking prices are quite high on many of their products. Race Ramps is in the business of making raceday-ready ramps and their immense product selection and storied reputation emboss this. Their lineup includes just about every size and configuration of race ramp you could think of including a nice selection of car chocks as well as hybrid types such as FlatStoppers and ramps intended for displaying vehicles at car shows. Their go-to material is a high-density expanded polystyrene that is then coated with a hybrid polyuria. While asking prices aren’t as high as many of the metal ramps out there, they still aren’t cheap in many cases. 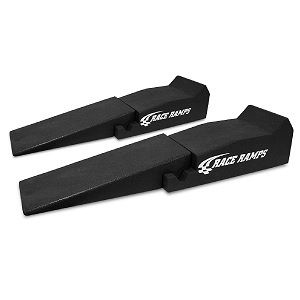 Rage Powersports is another brand that offers a rather robust lineup of car ramps and car chocks that span both metal and rubber/plastic materials. That being said, they do seem to have a heavier focus on transportation-related car ramps such as what you would use to load an ATV or lawnmower into the back of a truck rather than a traditional car ramp that you would use to lift up a car for servicing. Due to the wide range of products, their asking prices do vary quite a bit but seem to typically fall in the middle to upper tier. RhinoGear is considered one of the premier car ramp manufacturers, and for good reason. Their strong polymer material and optimal design allows for very impressive load ratings while maintaining a relatively lightweight and compact stature. They have a few different product types that vary in both shape as well as overall load rating but all share the great RhinoGear reputation. They aren’t the cheapest out there but you are paying for quality and build quality. RoadPro, as you might have guessed, offers a lot of products centered around making your experience on the road that much more enjoyable. This is a rather broad group of categories, ranging from your typical vehicles parts and accessories and even more unique things such as luggage. Speaking of unique, their sole car chock offering really stands out in that it is completely foldable and much different than just about anything out there. The asking price is very reasonable but this can translate to some questionable quality levels. Schwaben car ramps are a small but potent lineup consisting of a few modular low-profile ramps made of hard polymers. The result is a product that has a surprisingly good low rating and is still relatively light. That being said, the asking prices are somewhat high and for someone looking for simple chocks or that has an extremely heavy vehicle you may be out of luck. Supreme is another brand that apparently outsources most of their products and has offerings in many different categories. Their approach seems to revolve around low-cost budget items that try to fulfill the basic needs but by no means push the envelope in regards to performance or build quality. They offer a single example of a car chock: a bright orange example that has decent sales in the online world. Titan Ramps is one of the premier ramp manufacturers but they focus exclusively on loading-type ramps for mostly ATVs and garden equipment as well as providing various sizes of cargo baskets. So for those after that type of thing, keep reading. For someone after a traditional car ramp or car chock then you might want to skip to the next review. That being said, their build quality is superb but the asking price isn’t cheap. You might recognize this brand from other reviews we have written on this site. This is because TOOGOO sells all sorts of things in just about every category you can think of. Their approach for most products is importing very low-cost and oftentimes low-quality examples from China and trying to stand out due to their fantastic asking prices. That is no different here with their single car chock offering. Torin focuses more on jacks and jack stands as opposed to traditional car ramps but they do offer a few different types of car chocks. They try to stand out some by offering adjustable and folding car chocks that improve versatility as well as minimize storage volume. Prices are very reasonable but obviously, you sacrifice performance with car chocks. Vestil is one of the few brands that we have reviewed that focus exclusively on car ramps. Their ramps consist of both standard type ramps that you lay on the ground to elevate your vehicle as well as ramps that are designed to be hung from the ground into the bed of a trailer or from the ground to an elevated building entrance. Since they are designed to handle huge loads being directly applied to them, they come in premium metal materials and have expert craftsmanship. However, they are also extremely expensive. YM has one of the widest ranges of product lines that we have come across. While many other brands expand into other automobile and industrial categories, YM goes much further, delving into toys, electronics, and even health. Despite their wide range, they have one of the larger selections of car chocks that we have seen. There are many different shapes and sizes but all are based on a similar design and material. There are a lot of factors that play a part in determining what the best car ramp for your needs are. We discuss each of these metrics in greater detail below. This is an extremely important metric not only from a usability standpoint but also a safety standpoint. When shopping for a car ramp or car chock, you want something that can perform very well and easily handle the weight that you are throwing at it. Despite what some might think, there is a huge range of performance levels in regards to car ramps, with many products not having an acceptable load rating for larger vehicles. It is extremely important to understand how much your vehicle weighs and shop for car ramps that have a higher rating than that. 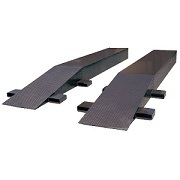 Typically, metal ramps will have the highest rating but there are also plenty of well-engineering plastic and rubber car ramps with acceptable load ratings as well. Build quality can go hand in hand with the performance but it is still worth having its own category. The build quality entails how well the car ramp is manufactured as well as the type and consistency of the material used. Things such as thin or cheap metal, poor welds, or inconsistent rubber or plastic and greatly affect the durability and life expectancy of a product. These weak areas are oftentimes stress risers and can be where cracks or chips form and grow. When you are putting thousands of pounds of load on something, a weak area can quickly grow, potentially ruining the ramp and putting your safety at risk. Ease of use refers to how user-friendly and convenient it is to use the product. Most of the time car chocks will be much easier to use than ramps due to their lightweight attribute as well as smaller size. So this metric really applies more to car ramps which can vary greatly in how easy they are to use. We have seen a rough correlation between the load rating of car ramp and how difficult it is to use. In other words, higher performing car ramps are typically larger and heavier which makes them more challenging to use, move, and store. However, some companies have found clever ways to work around this with the use of wheels, handles, the ability to stack ramps for storage purposes, modular pieces, and much more. These types of things are what we look for and having them in place will greatly help a product’s score in this area. Price almost always plays a part in determining what item to buy and that is no different here. Out of all of the products we have reviewed, car ramps have one of the widest price ranges. On the lower end, you have simple plastic car chocks which just about everybody will be able to fit in their budget. On the higher end, you have industrial-grade car ramps capable of holding tens of thousands of pounds and are extremely expensive. As always, we don’t automatically deduct points simply because a product is expensive. Rather, we compare it to other similarly priced products to see what is a good deal. The overall rating considers all of the metrics discussed above and comes up with a final rating. While not always an absolute, we typically stand by the notion that anything that scores a 3.5 or above is an acceptable buy. Things scoring 4 and above and a good buy. Things scoring 4.5 and the rare 5 are great buys and some of our top choices. These are our full reviews for all of the car ramps and car chocks discussed above. We break down how each fared in our metrics as well as list some of their models. In regards to load rating and performance, ATD wheel ramps are among the toughest you will find. As mentioned above, they come with an impressive 20-ton load rating which should handle even the largest truck and even quite a few commercial vehicles. The 13.5” wide wheel well means that even extra-large tires common on large trucks and farm equipment should be able to fit with relative ease. IN addition, there is plenty of elevation change which can greatly assist in getting up and under the vehicle to do whatever work needs to be done. The build quality is superb here. The metal used appears to be premium steel that is very thick and takes advantage of large, meaty welds to hold the various pieces together. The adjustable base is also very robust and appears to be something that should hold up to standard wear and tear for a long period of time. This is a rather large and heavy product so moving it around and storing it will be somewhat laborious. Once set, however, it is very simple to use. We do like that it has an adjustable base so that you aren’t stuck dealing with a single height. However, you will have to put some force in adjusting it. This may be a little challenging for a smaller individual. This is a car ramp that is intended for large and/or commercial applications and as such comes in at a very high asking price. For someone who is looking for a simple solution for their car or truck, this may be overkill both in regards to performance numbers as well as asking price. But for those looking for a much more powerful and capable car lift, you may be forced to pay the high asking price. ATD car ramps try to compete in the very top category in regards to load rating, build quality, and price. While they do accomplish making something that can handle just about anything you can throw at it, the extremely high asking price and bulky construction will be a deal-breaker for many. But for those will a large tractor or other work vehicles that weigh 10 tons or more, this is a great solution for your wheel ramp needs. The performance is great across the board. Beacon car ramps are designed to handle very demanding loads that are commonly found in semis and other commercial or industrial vehicles. Those with vehicles that weigh 10 tons or more and are looking for a way to easily service them will definitely be in Beacon’s target market. The impressive load rating is thanks to the usage of reinforced steel that is quite thick. The thickness does come at a price, however, as there isn’t much flexibility and adjustability for a given unit. The 24” wide ramps are plenty wide for even the largest of tires. The build quality is great across all of Beacon’s various sizes of car ramps and autoloaders. As mentioned above, you get to enjoy premium steel in the construction and the pieces are held together with well-placed and properly applied welds. If you decide to go with a Beacon car ramp you will enjoy something that should last for a very long time. In order to sustain such a large load, things such as adjustable heights and lightweight and small components are missing. You are left with a large, bulky product that is set to a specific height. If you are after something that is taller or shorter you will have to buy one of the other products. This is fine if you plan to stick with a single vehicle or type of vehicle but for those working on a wide variety of vehicles, it may be frustrating as you will have to buy several of these rather expensive ramps if you decide to use them. Thankfully, there are fork slots built into every size which makes moving them with a fork lift a breeze. True to form of other commercial and industrial-grade car ramps, these are very expensive products. For many, the high asking price will be simply unreasonable. But then again, for most, the high load rating is also not needed. People with tractor trailers or heavy farm equipment will understand the higher performance requirements and the high asking price for ramps of this caliber is simply the way things are. Beacon car ramps certainly impress us in the performance and build quality categories. The thick steel pieces are assembled with care and craftsmanship and the result is a car ramp that should last for many years of wear and tear without issue. However, this comes at the cost of little in the way of adjustability, a very heavy and bulky product, and a high asking price. A great product for those who actually need this level of performance but for everyone else it will simply be overkill. We are really impressed with how Black Widow car ramps perform. The load rating comes in at a very impressive 16,000 pounds which is not only one of the highest we have come across for non-metal car ramps but also for car ramps in general. The unique tread pattern also helps ensure a good grip on any tire you can throw at it. The width is a foot wide which means that cars and trucks alike can handle it with all but the widest tires being able to fit on it. Build quality is acceptable and Black Widow utilizes the tried and true molded plastic construction process. Rather than go with a solid base, they instead have a honeycomb-like pattern which does reduce the amount of surface contact area. We do wish that they would have considered going with a more solid and filled design but apparently, it isn’t necessary from a load rating standpoint. The combination of plastic construction and hollow middles means that these are very light and easily movable. 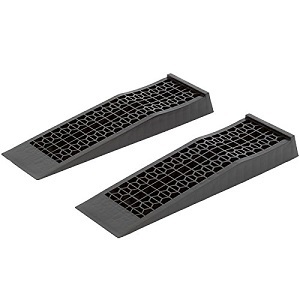 They are a bit on the large size so you will need to find adequate storage volume for them but assuming you have that then these are one of the easiest car ramps to handle with this high of a load rating. The costs for Black Widow car ramps are actually quite good and are more affordable than a lot of its competition. While there are a few cheaper options, few can meet the level of performance and grip that this product offers. 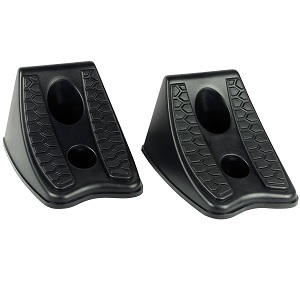 We are really impressed with the single Black Widow car ramp we have come across. The high weight rating truly surprised us considering its material and hollow middle but the fact that they were able to achieve that while still managing a lightweight result is great. And all of this comes in at an awesome asking price given what you are getting. We do wish that they had a few more product options since they seemed to be firing on all cylinders with this offering. The car chocks that Buyer’s Products sell are typically made of hard rubber as opposed to metal and their reinforcement is lacking. Because of this, don’t expect amazing performance out of these and plan to only use them to hold your car in place rather than elevate it off the ground. For those after a simple method to stop their car from rolling, these will work fine as most of the load of the vehicle isn’t actually pushing down on the car chocks. Build quality isn’t terrible but you will be able to tell that this is targeted towards those on a tighter budget. The rubber used appears to be a single piece construction likely made from some sort of mold and you won’t get the impressive tough appearance that you get with higher end metal car ramps and chocks. Operations if very simple to use and the decision to go with relatively thin rubber pays off here as the chocks are small and lightweight. As expected, you won’t get any sort of adjustability out of a given pair of Buyer’s Products car chocks as they are made of immobile rubber so you may need to shop around to find the specific size and slope that works for you and your particular vehicle. Asking prices here are very reasonable and should be within everybody’s budget. This isn’t surprising given the material used and its relative simplicity. Buyer’s Products car chocks are perfectly capable of holding tires in place so that the vehicle doesn’t roll but beyond that, you will want to find something more capable. We do like that this company has dealt with the common issue that car chocks possess in that they really aren’t a “one size fits all” and they do so by offering up a very impressive selection of products in various shapes and sizes and all coming in at a reasonable price. If you understand their limitations and applications then this a perfectly fine group of simple products. Nearly all of Camco’s car chocks are made of hard plastic or some sort of rubber compound. This is perfectly acceptable for most chock purposes but for those wishing to elevate their vehicle or someone who has a particularly large vehicle you may want to go with something more robust which with typically means that it is made of metal, is reinforced, and is much larger. Being somewhat of a budget item, these chocks utilize standard molding processes throughout. There is nothing wrong with molds but you will not get to enjoy the premium materials, welding, and overall craftsmanship common in higher-end car ramps. That being said, compared to other plastic and rubber chocks on the market these seem to be some of the most durable and reliable and should last for many years of standard use without issue. Camco car chocks are very lightweight, relatively small, and quite portable. This makes them a breeze to store and use. In addition, many come with a helpful rope or built-in handle which means that you can easily carry them without a struggle. They are also optimally designed to fit right underneath a wide variety of wheel sizes (depending on which model you go with) which means little in terms of struggling with proper orientation or manual labor. The asking prices here are very reasonable and among some of the more affordable car chocks you will find. You get a quality part that can handle most consumer-level chock tasks. 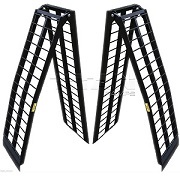 Camco focuses on car chocks over larger and more expensive car ramps. While we do wish that they had some car ramps to offer, their car chocks are of very good quality and meet the expectations one would expect of a consumer-level car chock. For those after something more robust for a larger vehicle or something wanting a solution that allows them to easily crawl underneath their vehicle, you will need to shop elsewhere. For being a made of a non-metal material, performance is surprisingly good at a step above most other plastic and rubber car chocks on the market. DEDC accomplishes this by using much thicker and more heavily reinforced plastic which allows for a higher load rating than other smaller, more flimsy car chocks out there. That being said, these still aren’t intended to be used as means to lift your car off of the ground and you will have to go with a traditional set of car ramps for that. The build quality is simple but effective. Similar to other plastic or rubber car chocks in the industry, DEDC car chocks take advantage of standardized mold processes which ensure a consistent shape and surface finish. There really aren’t any major weak points thanks to the heavily reinforced ribs on the underside and the combination of acceptable material and good construction means that this unit should last for many years. This product is a bit heavier than other smaller car chocks on the market but the fact that it isn’t a car ramp or made of heavy metal does mean that it is still relatively mobile. To assist with carrying, these products also have an attached rope on the end that allows for easier grip while transporting. The asking price for DEDC car chocks is a bit higher than many other examples you may find in this review. However, these are much heavier duty examples that utilize more material so a slight upcharge in asking price is completely reasonable. DEDC is rather limited in their selection but only offering one car chock and no car ramps but the example that they do offer is quite impressive. The heavy-duty construction and material mean that this unit can handle much more challenging roles and for a longer period of time. This does come with a higher asking price but it should still be well within the range of most people’s budgets. The performance is great on nearly all of Discount Ramps’ car ramps. Both the plastic as well as the metal examples hold up to standard abuse just fine and have acceptable load ratings (typically between 4,400 pounds and 5,000 pounds depending on the specific model). In regards to their car chocks, they are also of acceptable performance and can handle most non-commercial grade vehicles with ease. We also like the nice grips that are common on Discount Ramps’ products as this adds an extra layer of grip to whatever is above them. The build quality here is more than adequate. In regards to the plastic parts, most are made of single piece molded construction which is by far the most popular approach to take. The plastic used is of acceptable thickness and the reinforcement ridges inside and underneath the top area are plenty suited for the task. The metal car ramps are made of aluminum. While this doesn’t have nearly the load rating of steel products, it is assembled properly and without any major shortcuts being taken. The ease of use will vary somewhat depending on whether you go with car chocks or car ramps and also in what material you decide to go with. Being of a higher caliber construction, weights and sizes are a bit above average which means you may have more of a challenge finding a place to store these products and also in transporting them. However, you don’t have to deal with the immense weight of steel car ramps (which does come at the cost of some performance). The grips on the surface of these ramps are very helpful and allow for a much easier time in safely securing the wheels. Despite what their name suggests, prices for Discount Ramps car ramps and car chocks are average to above average compared to what else is out there. For those on a super tight budget it may be a bit of a stretch but for most, it should still be well within reason. Discount Ramps offers up a nice selection of car ramps and car chocks in both plastic and metal configurations. The performance is bumped up a notch thanks to a thicker material and proper construction methods but it does come at a slightly higher asking price. For those looking for a quality product that will meet your non-commercial needs then Discount Ramps is a fine choice. The performance of Electriduct car chocks is about average. 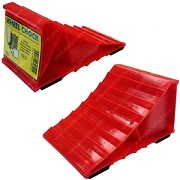 Since they are not ramps they don’t have to deal with the high loads which are probably why they’re able to get away with making their product out of plastic rather than molded rubber. The plastic also appears to be a bit thinner than a lot of the rubber examples we have come across butts it performs just fine despite that. One thing to note is that dropping this product or exposing it to impacts increases the likelihood that it might chip or crack more so than many of the rubber car chocks we have come across. The build quality is fine. It appears that the plastic has been molded in a way very similar to rubber examples and this results in a product that is consistent. It has both support ridges as well as a partially-built in internal section that assists in handling the load of the vehicle when it is being supported. The decision to go with plastic was actually very good with regards to ease of use. The plastic is much lighter than rubber and obviously metal as well which makes this product very easy to move and store. We have noticed that the plastic is more likely to slide or shift when compared to rubber, particularly if on a smooth or hard surface, so this needs to be considered while using. It is important to place the car chock in an area that it can get a good “bite” on the surface below. Finally, ridges on the top of the car chock are plenty large and beefy and should catch your tires with ease. Electriduct car chocks are very reasonably priced. This is the norm among non-metal car chocks and Electriduct has priced their product to be right at the norm for something with this level of performance and durability. These car chocks are simple and effective and it is refreshing to see a unit that is made of something other than rubber. The unique benefits of plastic do stand out some here (more lightweight, as tough if not tougher, etc). However, extra care does need to be taken in regards to what type of surface you put these car chocks on (more so than rubber). Performance is about what you would expect for a mid-level car chock. The material used is a quality rubber that is molded into the final shape. There are three internal ribs that help provide additional support and they are strong enough to handle most cars and trucks and even some campers. However, as we mentioned above these are not intended to lift a vehicle and if you attempt to do so it will likely damage the product. The build quality is more than fine and it should handle many years of typical wear and tear. While the rubber is obviously not as tough as metal, it is thick enough and of high enough quality that it can handle most casual loads. We do like the impressively sized ridges on the top of the shock as well as it greatly assists in keeping the wheels where they need to be. While there are some lighter and smaller car chocks on the market, this example finds a happy medium between size, weight, and performance. You should have no trouble moving and storing these units when not in use and when you are using them they’re easy to line up and properly communicate with your wheels for a snug fit. Ernst Manufacturing car chocks are very reasonably priced which probably explains why they are one of the more popular items of its kind for sale online. You do sacrifice some performance due to being plastic and obviously, you give up the car ramp ability but the trade-off is that it should be within everybody’s automotive budget. The Ernst Manufacturing car chock is a reliable and simple approach for those who are after something that can hold their vehicle in place (be it an ATV, car, truck, or a smaller camper). The build quality is more than adequate and the asking price is also quite fair. However, as we have mentioned, car chocks do have limited uses and we wish that Ernst Manufacturing would get into the car ramp business as well. While typically when we find a car ramp or car chock that is made of metal we expect an extremely tough competitor that can handle even the largest vehicles. However, that isn’t the case here as the metal that Goodyear car chocks use is quite thin and not even intended for lifting up a wheel. That isn’t to say that it doesn’t handle car chock abilities fine (because it does). But we do wonder what Goodyear decided to not come up with a more resilient product that could potentially double as a car ramp since they went with metal construction. Again, typically metal is associated with higher levels of build quality but the materials used here as simply too thin to be bunched in with the other (much more expensive) metal products out there. The car chock comes in a 3-piece construction that allows for the top to be adjusted and collapsed. Any time you are dealing with moving parts you run a higher risk of failure since there are simply more places that things can go wrong at. This product will do fine for a period of time but you may start to struggle with rusting and difficulty open and closing it as the wear sets in. From a convenience standpoint, this product is very simple to use. And, despite being metal, it is surprisingly lightweight. The other huge added benefit is the ability to adjust the angle of the chock as well as store it much easier since, when collapsed, it takes up very little space. But there are some concerns as well. 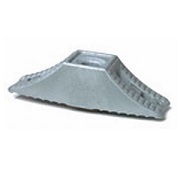 The metal doesn’t have the nice rubber and plastic ridges that many other car chocks have which improve grip between the car chock surface and the tire. The bottom may also be a bit more prone to slide if laid on a slick or smooth surface. The asking price for Goodyear car chocks is very attractive and among some of the more affordable examples you will find. This came as a bit of a surprise to us seeing how typically metallic chocks are much more expensive than plastic or rubber. And the fact that it has the adjustability features (a rarity) is a nice added bonus considering the price. The Good year car chock takes a refreshing and unique approach by combining metallic components with a low asking price. In addition, the ability to adjust the angle of the unit as well as collapse it for easy storage is really cool. That being said, the performance is average at best and you do run the risk of having a lower operating life than you would with a solid one-piece design made of plastic or rubber. These units are made of relatively thick rubber and overall do an average job compared to what else is out there. Being just car chocks, they aren’t expected to hold large amounts of direct weight and Hopkins goes even further to state that they aren’t for commercial use in their product description. That right there tells us that these aren’t as heavy duty as the name suggests. However, they will do a fine job for your typical car or truck. While not completely solid, there is a good bit of internal rubber that helps further support the chock while in use. While these are obviously imported, the quality is a bit better than many of the other brands that do this. Coincidentally, the asking price is also a bit higher. The main thing with rubber like this is “more is better” when it comes to loading strength so by thickening things up they are able to not only improve load performance but also give off the feeling of higher quality. Hopkins wheel chocks are very simple to use. The rubber, while somewhat thick, still is light enough to make mobility easy. In addition, the semi-hollow middle allows for stacking which greatly decreases storage requirements. The grooves on the top of the product are not the most robust we have seen but they are still large enough to allow a better grip with the tire. Car chocks typically aren’t overly expensive and that is the case here as well. That being said, the asking price for these is a bit higher than many other car chocks on the market. We assume the justification is that these are noticeably thicker and more robust than many other car chock examples which most likely gives Hopkins justification to bump up the price some. Hopkins car chocks are a bit limited in just having one model and this model is explicitly stated as not being intended for commercial use. This really limits the target audience. For those who are looking for non-commercial wheel chocks (instead of car ramps), these perform just fine thanks to the thick rubber. They are also simple to use. However, the asking price is a bit higher than other similarly-performing models on the market. All of the House Deals car ramps perform extremely well. The lowest rating comes in at 6,500 pounds (which is enough for most cars) and this goes all the way up to very impressive 12,000 pounds in their non-metal example. In their hydraulic unit, extra elevation can be achieved by actuating the built-in hydraulic cylinder. This is on top of the already elevated point since you have to drive up the car ramp to engage them. The width of these ramps is also plenty wide and can handle vehicles that have above average tire width. Build quality is held to a very high standard here and any House Deals car ramp you purchase should last for many years. In fact, some of their higher-rated examples are designed for light commercial and industrial applications as well so you know that their quality levels are on point. In the non-metal units, you will enjoy thick and premium materials with good load ratings and resistance to scratches and impacts. In their metal products, the weld sections are done very well and their solid steel example is as tough as it looks. There is a bit more of a learning curve with these car ramps. They are on the larger and bulkier side, particularly in the metal ones, and moving and storage will take a bit more planning. The hydraulic car ramp is surprisingly simple to use, however. That being said, extra care will need to be taken to make sure that you properly align and center the jacks under the wheels since it will lift the car quite high off of the ground. All examples also come with nice grips which help with stability. As mentioned above, House Deals car ramps are targeted more into the premium category. For those willing to pay, you do get a high quality and well-performing car ramp but it will require you opening your pocketbook a bit wider. Performance is simple and effective. These car chocks are made of hard plastic and have two internal ribs to get additional support. Obviously, these won’t have quite the load rating of examples that are solid plastic but the fact that the ribs are somewhat thick and also considering that car chocks typically don’t have to handle extreme weight loads means that they still do the task. 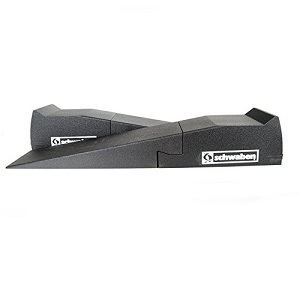 The serrated edge is actually quite aggressive and has a good grip on any rubber tire that it comes in contact with. The build quality here is about what you would expect for something at this price point. The unit is made a formed plastic mold and they are typically consistent from one example to another which helps to ensure a better balance. The supports are well-placed and seem to be designed so that they will last for quite a while without issue. 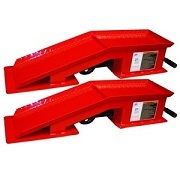 These are extremely lightweight car chocks and are very simple to move. That being said, they are on the small side so extra care will need to be taken when trying to center up with the tire. In addition, these don’t have the hollow internal shell that allows them to be stacked for storage purposes so they will take up a bit more space because of this. In addition, the rubber grips we like to see on the base of plastic or metal car chocks is nowhere to be seen so you may have to deal with some potential slipping on smooth surfaces. We really like the competitive price point that Husky car chocks are able to manage. These are extremely affordable and should be within everybody’s budget. And even with the great price point, quality is up to a decent standard. Husky car chocks try to stand out not only in their bright orange color but also in their simple yet effective approach. For the most part, they meet these requirements in the performance category thanks to well-placed and thick ribs but there are some minor usability considerations that you will need to look out for such as a lack of a bottom grip and no ability to stack them for storage. All in all, for this price you can’t be too picky. For their specific application, Larin car and loading ramps perform quite well. The metal used is high quality and surprisingly thick. This means that it should easily handle an ATV or small farm equipment loading to and from the back of a truck. Two of their three ramps also have fully attached sides which means you won’t be fumbling as much trying to get the tires perfectly centered on a narrow avenue. You can expect load ratings of around 750 pounds. We appreciate good build quality when we see it and Larin definitely hits the mark. Being made of metal, having proper and correct welds is very important and as far as we can tell Larin achieves this. Also, as mentioned above, the quality metal is not only a good caliber but also quite thick so you should have no hesitations in using this product. There is a bit of initial setup when using these since they require properly mounting them to your truck bed and then orienting the other side with the ground. The folding ability that we have enjoyed with other similar products is also nowhere to be seen here so you will need to dedicate quite a bit of storage space to put a Larin car ramp when not in use. The other con of using thick high-quality metal is the added weight. We recommend 2 or more people to assist when trying to transport one of these units as they can be quite heavy. Finally, we aren’t huge fans of the added grips on the FSR-2SL and wish they would have gone with conventional serrations like we are used to seeing rather than circular holes. These car ramps certainly aren’t cheap but for the category that they are in, they are actually quite competitive. In other words, someone, after a simple car chock or car ramp, may be turned off by the asking price but you aren’t really in Larin’s target market here. For those after a solution for loading their ATV into the back of their truck, we think you will find Larin’s asking price more than reasonable. Larin car ramps meet a specific need and for those after this particular application, they provide a quality product that should last. There will be a decent amount of initial set up but that is typically the norm for this type of thing so we can’t be too judgmental towards it. Asking prices are high but compared to other similar products it is plenty reasonable in our book. For their desired application, Lund loading ramps fare quite well. The combination of metal used as well as superior design results in a common load rating of around 1,500 pounds. This is plenty for even the most demanding box and also quite a few types of ATVs and farm equipment. 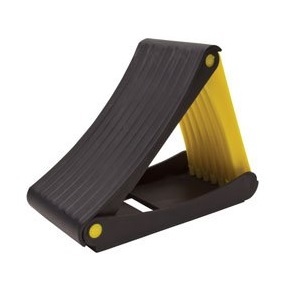 There are also extruded hole surfaces that provide much-needed traction against both wheels as well as the bottom of your shoes if you are trying to push or pull something up or down the ramp. Build quality is in point and Lund stands behind their products with an impressive 3-year warranty. We have not seen any major quality issues with any of their products. The metal is relatively resilient to moisture and fights off rust quite well. There are few welds and it appears Lund instead opted to use a single large piece of material and bend it where possible. This takes out some of the stress risers that are common in welds in improves the overall toughness. These are quite large and bulky ramps but that is to be expected with this type of product. To assist, many of Lund’s loading ramps have a bi-fold design that essentially cuts the width of the product in half. However, you are still going to have to deal with a pretty long ramp, oftentimes 70” to nearly 80” long. As mentioned above, we like the extruded hole surfaces and it makes using this a lot easier. You may be initially shocked by the asking prices here but it is important to remember that these aren’t traditional car ramps. They are loading ramps and in that line of products, these asking prices are plenty reasonable for what you are getting. Lund doesn’t really work in the car ramp or car chock industry but their car loading ramps are worth mentioning. For people in the market for an easy way to load or unload items from the back of their truck or warehouse, this lineup performs just fine. Thanks to a high-quality metal and expert manufacturing, you get to enjoy good load ratings and a long-expected operation life. Depending on which type of MaxxHaul loading ramp you go with, it will likely either come in aluminum or steel material. Both doe an acceptable job of handling loads but, as expected, the steel seems to be able to handle a bit more for a given size. The thickness of supports that exist are of acceptable thickness and should hold up to the standard wear and tear that one goes through while loading smaller items. Depending on which product you go with, you can expect a load rating of between 500 and 1,500 pounds. Obviously, this is not a big enough number to handle vehicles but there are plenty of other applications they can be used for. The build quality here is very good. The material selected great quality and the weld points (one of the most important areas of a ramp) or beefy and consistent. We also like that they use galvanized aluminum to help with corrosion on some of their carriers. There is a bit of initial set up to use these but, compared to other brands out there, the amount of effort required is average if not slightly below average. 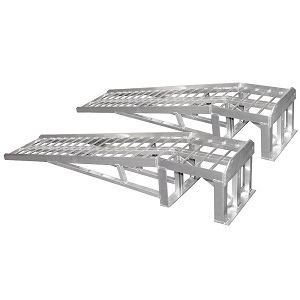 The ramps attach to the tail of your truck or loading dock with well-placed lips rather than the more elaborate bolting mechanisms we have seen in other products. MaxxHaul also offers some ramps that are somewhat adjustable so that you have a bit more control over the slope. However, like all load ramps, they are quite long and can also be heavy (particularly in the steel examples) so extra care will need to be taken. As expected, this type of loading ramp runs a bit higher than most car ramps. They are intended for entirely different purposes. 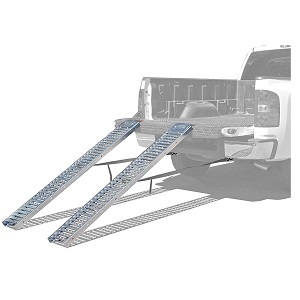 But compared to other load ramps of a similar caliber available today, the asking prices are more than fair. MaxxHaul doesn’t really deal in car ramps but their loading ramps offer up another nice contribution to that industry. The materials used are good quality and the craftsmanship is there. You also have a decent variety of types (despite there only being 4 that we came across) with one even having the ability to be adjusted. The asking price is also more than reasonable for what you are getting. A decent choice if you are in the market for this specific type of thing. There really is no other way to say it. Omega car ramps have absolutely phenomenal performance. Their load ratings are among the highest we have come across and will handle anything you could think to throw at them. They have several products that are designed to support up to 20 tons (40,000 pounds) of force. This is multiple times higher than any commuter vehicle you might be driving and is capable of handling many commercial and industrial-grade vehicles. This is accomplished thanks to Omega’s heavy gauge steel frame found throughout the entirety of the product. 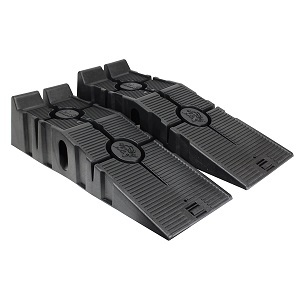 There is also heavy reinforcement material on both legs and the ramps are wide enough to accommodate very large tires. Build quality is superb on all Omega car ramps. The steel pieces are expertly attached with great welds where needed and additional support bolts in some places. The included handle and transport wheels are also built into the frame of the product in a very sleek way that combines aesthetics with functionality. We also like other subtle features such as the retractable t-handle and non-skid rubber matting which we will get more into below. One of the major challenges with using high-performance car ramps is that they are typically very bulky and heavy. And that is the case here as these ramps can weigh hundreds of pounds each. To assist with this, Omega has included built-in wheels underneath as well as a helpful t-bar that can make moving the ramps from place to place much easier. The inclusion of non-skid matting underneath also assists in providing better grip (which can be a common complaint when using metal or hard plastic car ramps on a smooth surface). That being said, these are still very burdensome to move around and will require a good bit more effort than your typical car ramps. Now the tough part: this lineup of ramps is extremely expensive. They are easily some of the most expensive we have reviewed and may be well out of many people’s budgets. But at the same time, they can do things that few other ramps can do in that they are designed to handle extremely heavy vehicles. So if you happen to have one of these types of vehicles you will be forced to open your wallet a lot wider than someone who doesn’t. Omega car ramps really blew us away in their insane load ratings, impressive material selection, and outstanding build quality. They are also loaded with some helpful features that make moving them a bit easier such as wheels and a t-bar. However, the asking price is extremely high and they will never have the mobility and storage ability of smaller car ramps. This is a price you will have to pay if you want something with these load numbers. Loading performance is simply fantastic, with the advertised load rating being up to 20 tons. This makes OTC car ramps great for large trucks or tractor trailers which would easily overwhelm and destroy lower-end ramps. The ramps are also very wide, allowing up to 10-inch tires to be able to a comfortable fit on them. This impressive feat is thanks to the use of premium steel along with a very large set of support stands on the front and rear of the ramp. As you might expect for a car ramp with this level of load rating, the build quality is great. The steel is a good recipe and can easily handle the typical bumps and scratches that a set of car ramps will go through in their life. The included rubber wheels, t-handle, and rubber matting as also of high quality and don’t feel out of place next to the premium steel. In addition, there is even a storage case built into store various items. This is a large and heavy car ramp and there really is no getting around that. To assist with this, OTC has included a set of heavy-duty rubber wheels as well as an adjustable t-handle that allows you to roll the ramp around instead of carrying it. This is a huge relief as these ramps are very heavy! As mentioned earlier, we also appreciate the rubber grips on the bottom and a unique storage case built directly into the unit. Our only minor complaint has to do with the grip holes located on the ramp. We wish that they were more plentiful or potentially more serrated as we have had better luck with these types in the past when it comes to getting a good grip with the wheels. For car ramps designed for tractor trailers and industrial equipment, you need to be prepared to pay a high price for them. Making products that can handle that sort of weight and abuse doesn’t come cheap and OTC’s asking price may give some sticker shock. However, you may be surprised to realize that compared to other similar products, their asking prices are actually quite reasonable and they are able to do that while maintaining similar quality and performance standards. OTC car ramps are not for everyone. In fact, they should more accurately be called truck ramps as somebody with a car will save a lot of money going with a cheaper, less powerful solution. But for those with large trucks that can easily reach 10 tons or more, this is a great product that is actually very competitive in regards to asking price. For simple car chocks, these work just fine. Both the plastic and rubber are thick enough to handle your typical vehicles but for more demanding applications you will want to go with something more robust. They have semi-solid internal shells which greatly assists in handling the load of a vehicle on them. That being said, we have found that the rubber car chocks are a little tougher and handle the occasional drop or scrap that is sure to happen during operation. These are very affordable products so don’t expect the build quality and construction of more expensive examples on the market. Both types are made with a simple mold and there will be a bit of variance from one example to the next (but it doesn’t really affect performance). A nice bonus is that by not utilizing metal these can handle adverse weather conditions much better. 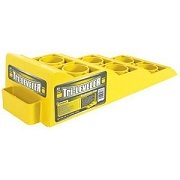 Performance Tool car chocks are very lightweight and are quite small, making them very easy to use and transport. That being said, some people have complained that these car chocks are too small and may struggle properly centering them up with tires, particularly if they are larger tires. 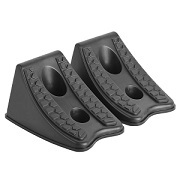 Also, the plastic car chocks can struggle some with sliding since they don’t have a large and high grip base. Asking prices for these products are extremely competitive and should be within everybody’s budget. This is somewhat the norm when dealing with non-metal car chocks and there are many similar products that fall within this price range. Performance Tool car chocks take the somewhat popular approach of offering simple and low-cost examples. One way that they do stand out some is by having both plastic and rubber, with the rubber performing a bit better in our opinion. Either one, however, will perform fine for simple application but if you are after something with higher load ratings (or obviously something that actually lifts the car off the ground), you will need to shop elsewhere. The biggest pro that we have when it comes to Pit-Pal car ramps is the huge selection and how they likely have a specific shape or size to meet your needs. They car ramps are also made of metal which typically has a higher load rating than many of the plastic and rubber examples out there. However, since these are made of aluminum and the walls are somewhat thin, the extremely high load ratings we have seen from other metal products isn’t here. So for those trying to find a car ramp for a very heavy vehicle such as a semi or farm vehicle you may want to go with something else. As we have alluded to, being made of metal is always a huge positive for us. And the aluminum that Pit-Pal uses is of rather high quality. It appears that they try to use a single piece of aluminum where possible and bend it as necessary but in areas where multiple pieces are required, the welds are very nice and thick. One thing to note here is that these products are very simple. Wheels, handles, and adjustable settings are not here which makes meeting a build quality threshold much easier. There are two trains of thought here. The fact that thin aluminum is used and that it is approached in a very simple manner means that compared to other full-sized car ramps on the market, these are noticeably more lightweight and easier to move and store. However, it also means that you are limited in adjustable settings and helpful features such as wheels. That may be why Pit-Pal offers so many different car ramps since they don’t really have a “one size fits all”. Also, the serrations or holes that are oftentimes used to help with tire grip are nowhere to be seen. This is also the case on the base which can make Pit-Pal car ramps more prone to slide. Asking prices are rather high. While we are used to metal car ramps being a bit on the expensive side, these are missing a lot of the features that we are used to seeing as well as the much higher load ratings. In addition, typically aluminum isn’t quite as expensive as some of the steels used so we aren’t really sure why the price is as high as it is. Pit-Pal car ramps and wheel chocks offer up a nice variety of products. Their main focus seems to be on metal car ramps and they utilize aluminum over steel which is somewhat unique. Their simple approach is good in that it makes the product lighter and simpler but it also makes them a little more difficult to use. Asking prices are also quite high considering the load ratings aren’t up to the caliber of other similarly-priced car ramps. The performance of Race Ramps is more than adequate for many vehicles. A majority of Race Cramps are rated to 1,500 pounds per ramp but for those with trucks or other heavier equipment, they do have ramps that can handle 5,000 pounds and more. This is thanks to their special polystyrene material that allows for great toughness and load resistance while still being relatively lightweight. 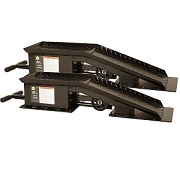 For those with semi-trucks or extremely heavy equipment that is 12,000 pounds or more you will likely still need to shop for more robust steel-based ramps but for the vast majority of people, these will have a plenty high load rating. As for grip, you might notice that these products don’t have the huge serrations of grip holes like other models but the material used is surprisingly grippy and isn’t needed in most cases. 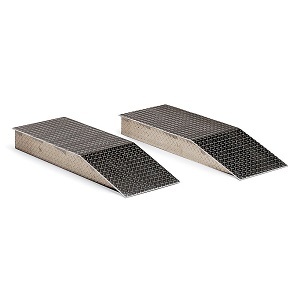 Race Ramps are held to high manufacturing standards despite their simple appearance. 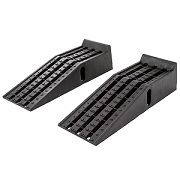 As we mentioned above, the material is by no means cheap and it would be silly to compare it to many of the much cheaper plastic and rubber molded car chocks and car ramps also on the market. They are also more impervious to the occasional drop or bump and also can handle most fluids without damaging the material. The underside if fully enclosed which takes away the cavity feature present on many race ramps and is likely a big reason why they can get the load rating that they do. Race Ramps are surprisingly lightweight given their size and performance and you should have no problem moving them around. For the larger examples, they sometimes come with back straps that allow for even easier mobility. Furthermore, some of Race Ramps’ car ramps are even modular and allow you to remove inclined portions if so desired. And due to the sheer number of various sizes and lengths, you don’t have to worry about trying to force something due to not having the correct size: Race Ramps likely has an exact product that meets your needs. Asking prices here might seem a bit higher than most of the other non-metal car chocks and car ramps on the market. And they certainly are. However, for the higher asking price, you get a product that truly does perform much better than most of the other competition. The combination of higher load rating, ease of use, and proven reputation helps to justify Race Ramps higher costs. Race Ramps truly is in a class that few other brands can compete with. Their proven approach and great material formula equate to a product that does its jobs and does it well. The sheer number of choices is extremely impressive and no matter what type of car chock, race ramp, or anything in between that you are looking for, Race Ramps likely has a product for you. It seems that Rage Powersports’ material of choice when it comes to metal is aluminum. This is a great metal for helping to ease the carrying weight but it also typically has a lower load rating. That being said, with the focus being on lighter things such as 4-wheelers and for moving goods, it does the job just fine. And for those who do have vehicles that they want to transport, this company does have some examples that meander into the 5,000 pounds and above range. For these examples, you can expect extra thick aluminum panels with plenty of support bars on the underside. We are content with all of the Rage Powersports car ramps we have come across. The aluminum requires quite a few welds most of the time (mostly due to the somewhat complex build structure) but the welds are of an acceptable quality which greatly assists with strength. 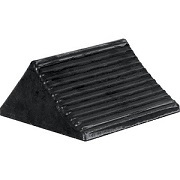 For the few non-metal ramps and chocks they have, most seem to be the standard hard rubber that most brands use. From a weight standpoint, we definitely are glad that aluminum was used over steel. Many of these ramps are quite long and do not have the ability to be folded so weight and also storage room are definitely factors to consider. The weight is, for the most part, kept in check but you will have to plan for having a pretty large area to store these when not in use. We do like the great grip you get with the ramps as the aluminum beams run perpendicular to your tires with gaps in between, helping to make for an excellent grip. They are also decently wide so as to be able to handle most car tires. We weren’t super impressed with asking prices. They seem to be in the higher price range and will be similarly priced to many steel-based ramps out there. However, we understand that loading ramps (particularly ones of this size) aren’t cheap so it is something we have come to terms with. Rage Powersports brings us a nice selection of car ramps (and a small batch of car chocks) that are mostly centered on loading and transportation applications. The utilization of aluminum in most is done quite well and the load ratings vary but on the higher end can handle enough for most people’s needs. The asking prices are high, however, and some people may be more inclined to go with a steel example if they have the storage space and ability to move them. We are very impressed with the performance of RhinoGear car ramps. Typically car ramps of this caliber are made of various types of metal, making them both heavier as well as more expensive. RhinoGear is able to compete with those products through the use of its patented internal polymer support system as well as a wider stance that allows for a better distribution of weight. The included grips on the top of the car ramp also make for a much better grip during use. Common load ratings include 12,000 and 16,000 pounds, making these car ramps capable of handling all but the largest of vehicles. Don’t let the fact that these are a plastic fool you: build quality is excellent. The molding process RhinoGear uses is quite tuned in and you get a consistent and reliable batch in every product. This is a big reason why they are the only resin ramp that meets and exceed P.A.L.D. (Portable Automotive Lifting Device) standards. Another benefit of the one-piece design is that there are fewer areas that quality weak points can occur. We love how easy these are to use, particularly when compared to other car ramps on the market. The decision to go with a hollow polymer over metal means you get to enjoy great savings in product weight which makes for easy moving. In addition, the fact that they are hollow also means that they are nestable (able to be stacked inside one another) which greatly reduces how much storage volume they take up. 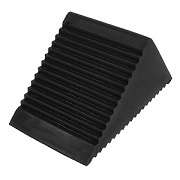 The CoreTRAC non-skid base helps to reduce slippage, which is a common concern among hard plastic car ramps. Finally, the 17-degree incline is shallow enough to meet the needs of even low-profile vehicles while still elevating it up to an acceptable height to easily get underneath. Being such a high-quality car ramp, these are not the cheapest products you will come across. However, they tend to be noticeably cheaper than their metal counterparts and perform as well if not better in many cases. RhinoGear car ramps are well worth the higher asking price. We are extremely impressed with what RhinoGear has to offer in their small lineup of car ramps. The performance is excellent despite not being made of metal and the cost and weight-saving benefits of going this route are noticeable. Other helpful features such as the ability to stack them inside one another, excellent grips, and a strong and wide support make these a home run choice from us for anybody after a high-quality set of car ramps. Unfortunately, the RoadPro car chock can really struggle. The components are made of thin plastic and the folding design results in a very small area having to handle the entire potential load. This can cause buckling, cracking, and even breaking. This is obviously something you want to avoid when you are talking about holding vehicles that can weigh multiple tons. The hinge that holds the parts together is also somewhat flimsy and prone to popping out prematurely. This product is rated for 2 tons but we would still be hesitant to put this much force on it. As you might have guessed, we are a bit disappointed in the build quality. There have been several reports of the RoadPro wheel chock literally falling apart upon first use. Apparently, the hinge that allows for rotation is not securely fastened in many examples, making it prone to failure. The plastic that is used has to be very thin in order to achieve the folding feature and it simply can’t handle the load it is expected to support. We think for such an innovative shape such as this to work, much stronger metal parts should be used instead of plastic or rubber. When this unit works, it is extremely easy to use and quite convenient. Car chocks typically don’t take up much space to begin with and by adding a folding feature, RoadPro has made something that can take up even less space. Also, since it is made of plastic and has a hollow middle, it is extremely lightweight and can be easily carried by anybody. It is a bit on the small side, however, and may simply not have enough surface area for larger tires. But, then again, we wouldn’t recommend testing this on anything with a tire that large since it likely is quite heavy. The main bright point here is the asking price. Even among budget car chocks, this is likely one of the most affordable you will come across. Obviously, this comes with quite a few questionable aspects as mentioned above. But we can’t deny the combination of a unique approach and a great price. RoadPro car chocks find a way to add some flair to what may otherwise be a rather mundane topic in car chocks. The unique design allows for great mobility and minimal storage space. However, it has some glaring performance and quality issues that we simply can’t overlook. When it comes to a product that needs to be safe we take things pretty seriously and despite the great price, there are some major red flags here. For their size, these car ramps put out more than average load capabilities. They tend to be rated to around 3,000 pounds which make them good for most small cars and ATVs. However, those with large trucks or other heavy-duty equipment might be out of luck. The low-profile design is able to handle this relatively high level of weight because of premium polymer materials and a solid shell. As for grip, the material holds well against the rubber material on tires and should also be able to do so in less than optimal conditions where various fluids may be exposed to the ramp. The build quality is simple but effective. The material is consistent and the molds hold true to form, resulting in a product that is reliable and should last for several years of typical wear and tear. The fluid-resistant body is also nice as you don’t have to worry about some stray oil or grease messing up car ramps. 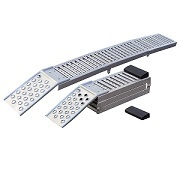 These ramps are extremely easy to use for multiple reasons. As outlined above, they are quite light and are easily moved by a single person. You also don’t have to worry about trying to avoid fluids from touching them as it typically has little effect. Furthermore, the grip on both the top and the bottom are good and you shouldn’t have to worry about sliding. Probably our favorite feature is the fact that the ramps come in modular pieces and can be taken apart which greatly reduces the storage volume that you need. These are pretty expensive car ramps and fall into the premium level price tier. At this level, you should have pretty high expectations. Schwaben car ramps definitely impress us in many regards but their relatively low load rating may be a bit underwhelming given the price. Schwaben’s small lineup try to find a happy medium between performance and ease of use. They definitely have got the latter down. 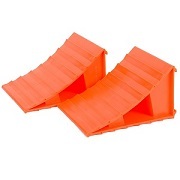 These ramps are lightweight, have great grip, and can be broken down into multiple pieces for easy storage. However, they are quite expensive and the load ratings are low enough to make them deal breakers for many with heavier vehicles such as trucks and SUVs. Performance for Supreme car chocks is serviceable but not much beyond that. They are made of strong plastic and have a relatively weak internal spine that provides additional support. Similar to most car chocks, these aren’t intended to handle high levels of direct load and are rather intended to simply hold a vehicle in place. In that regards this unit does fine but don’t expect it to do much beyond that. We also wish they were a bit wider to accommodate the wider tires that are often present in larger trucks and farm equipment. This is a budget item and the build quality reflects that. While there are no glaring issues, you will quickly realize that this is a low-cost car chock. The molded plastic structure doesn’t have the sort of optimized supports and loaded features present on more expensive examples. Rather than have a built-in lower grip, it simply has pieces of rubber glued on. Thankfully, do the mostly static nature of car chocks this product should still serve its purpose for an acceptable period of time. We do like how simple Supreme car chocks are to use. The lightweight and thin plastic pay off here, making the product easy to move and store. And while the rubber underside isn’t the prettiest, it does serve a helpful purpose of reducing skidding (an issue common in non-rubber car chocks). The somewhat narrow width does mean that you will need to be a bit more careful when lining up with wider tires. This is a very competitive price point and should fit anybody’s budget. The decision to go with plastic over metal and minimizing the additional features pay off here and allows Supreme to sell this unit at a very attractive price point. Supreme car chocks are limited in having just one product and it fits the expected norm of other Supreme brand products by being serviceable but affordable. For most this unit will do its job for someone after true car ramp or a more robust car chock, you will need to look elsewhere. Titan Ramps loading ramps have very impressive load capabilities given the size. Many of their cargo baskets can handle 500 pounds or more of a load while their ramps typically handle around 1,500 pounds. Obviously, this is far lower than what most cars weigh but it is plenty for someone trying to load or unload a palette, furniture, ATV, lawnmower, etc. Given the load rating, the rails are surprisingly small and this is thanks to using premium metal components and simple design which minimize potential weak points. The build quality of these products is superb. As mentioned earlier, the metal used is of high quality and most are rust-resistant and the welds that hold the various pieces together is expertly done. Titan Ramps has appeared to do a “keep it simple” approach in that many of their products don’t require any sort of complex installation or assembly. This allows them to have high load ratings despite being relatively lightweight and thin. These products aren’t small in regards to length but then again few loading-type ramps are. This means that they will require a bit of extra storage space. Some examples do have the capability to fold in half, which greatly reduces how much area they take up but they will still typically be significantly larger than your standard car chock or car ramp. The important thing to remind the reader here is that these are not car ramps or even car chocks in the sense. You wouldn’t use them to lift up your car for inspection or to chock it in place. They are intended for storage and transport of lighter materials and palettes. This may be a deal breaker depending on what you are looking for. Titan Ramps are not cheap. 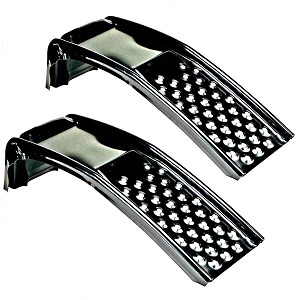 They are among some of the more expensive car ramp related products you will come across. However, for this level of performance and load rating, you need to be expected to pay a decent sum and anybody serious about safety and not cutting corners should be willing to open their wallet a bit wider. The good news is that someone after normal car ramps can find a different product that fulfills their needs for much cheaper. We really like what Titan Ramps brings to the table here (assuming a loading-type ramp is what you are after). The quality is on point and the load rating makes it great for moving and even for some commercial or industrial applications. However, many people reading these reviews will be after a traditional car ramp in which case these products will not meet your needs. The performance is very average here. You are basically buying a pie-shaped block of rubber. We can that car chocks aren’t overly complicated and oftentimes simply putting a lot of material in a cube-shaped volume is all you need to make a good car chock. However, the rubber here is of lower quality than what we have seen in other areas. It is more susceptible to chipping and flexing in general. Because of this, we don’t recommend using TOOGOO car chocks on larger commercial-sized vehicles or equipment. As you might expect for the price, build quality is also somewhat hit or miss. We have already gone over the quality of the rubber used but the mold itself has quite a bit of variation to it. We have seen it common for flaps or bits of rubber to be added or removed compared to another mold which can lead to some inconsistencies when trying to balance tires on them. Due to the very simple and straightforward approach, these are quite simple to use. The mold does include serrations which are nice. This coupled with the somewhat “gooey” rubber compound means that there is plenty of squeeze and grip which is nice. But the chocks are a bit on the small side and the variations in mold shapes mentioned above can lead to some potential issues with having an equal weight distribution. Easily the biggest selling point here is the fantastic price. TOOGOO car chocks are among the cheapest you will find anywhere. Just understand that shortcoming that is present with these. But for those focused mostly on saving money, this may still be the deciding factor. For those looking for simple car chocks and on an absolute penny-pincher level of budget, you may be able to make this work. For everyone else out there, spend a few extra dollars and get something that is of higher quality and will last longer. The performance here is about what you would expect from car chocks. Torin car chocks do have the ability to have an adjustable height which we like to see but, as we have mentioned in other reviews, this does impact how much load they can actually handle since the folding component means that it is not made of single-piece construction and the materials used have to be thinner so that they can fold downward. To somewhat offset this, Torin takes advantage of heat treat and drop forge manufacturing. But it is still important to in understanding that these aren’t designed to have much weight laid directly on top of them. The build quality is more than acceptable. As mentioned above, the use of metal components that are used are heat treated and drop forged which is a nice bonus that many other competitors skip. The metal used should also be more resilient to corrosion but you still may deal with some over time, particularly if you plan to leave this in an outside environment. With typical use and storing indoors, these should last for a few years without issue. 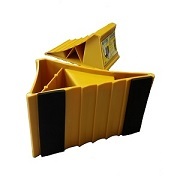 These car chocks are a breeze to use thanks to their lightweight construction and ability to be folded. You should have no problem finding a nook to store them away in and they are very simple to lift up and secure into their upright position for use. Our major complaint is that the small stature of them does make it a bit more challenging to properly line them up with larger wheels. In addition, if you do happen to get some corrosion or dirt around the rotating assembly it may be a bit stubborn in opening and closing. The asking price for Torin car chocks is fantastic and well into the budget range. 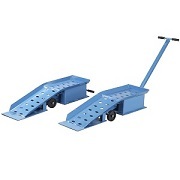 Anybody looking for simple and effective car chocks should be able to swing the small amount of money it costs to acquire these and, while you don’t have the impressive loading performance of car ramps, these are also available for much cheaper. Torin provides us with a few simple and effective car chocks that break away from the norm of molded rubber and plastic and offer up adjustable thin metal instead. The tradeoffs may be good or bad depending on the person but for someone looking for a simple and very affordable solution to chocking up their wheels on most standard vehicles, these will do just fine. In terms of raw loading ability, Vestil car ramps are among the best in the industry. They can handle many thousands of pounds, with their truck wheel ramps being capable of holding an impressive 15,000 pounds of force. This is accomplished thanks to premium aluminum construction as well as reinforced walls and fasteners. They are also quite wide, with most of their products ranging between 18” and 28” of width. This means just about any sized tire that you have on your vehicle should be able to fit with ease. As you would expect with products of this load rating, Vestil car ramps have excellent build quality. As mentioned above, you get to enjoy premium metal parts instead of rubber or plastic, and the individual pieces are held together with excellent welding that leaves little to doubt. The thick reinforcement ribs are plentiful and are all done with great craftsmanship. If you decide to break down and buy one of these expensive products you will have something that will last for many years of typical use. Because of their immense size and weight, Vestil car ramps can be a bit daunting to use. Nearly all of them weigh well over 100 pounds individually and since they don’t have any sort of folding capability, they will take up quite a bit of storage space as well. However, once set, you will get to enjoy a much wider driving area which makes lining up your vehicle on it much easier. In addition, despite being metal, Vestil has included helpful ridges or grooves on their products which give additional grip with tires. And, of course, going with car ramps over car chocks gives the added benefit of having much easier (and safer) access to the underside of their vehicle. There is no way around it: these units are extremely expensive. In fact, they are among the priciest you will find in the industry. Obviously, we expect metal car ramps to cost a good bit more than a cheap rubber car chock but for a lot of people, the asking price will be too high for them to consider. That being said, it is important to remember that these car ramps are designed for commercial or industrial applications and frankly would be a huge overkill for must casual applications. For those that fall into Vestil’s target market, it will be an investment that is well worth it. Vestil car ramps take a niche approach of dealing exclusively in highly demanding commercial and industrial applications through their large selection of car ramps. Their products can handle enormous loads and the build quality is at a level that means that these should pay for themselves many times over. However, for many, the price and capabilities will be huge overkill and simply not worth the premium asking price. You first need to decide what sort of applications you plan on using your car ramps for and that will dictate whether or not you should consider purchasing these. These are very sturdy and capable car chocks. While many other brands have hollow or semi-hollow internals, YM car chocks utilize a thick and solid base which greatly improves the amount of load they can handle. The rubber used is very thick and beefy and should be able to handle any type of vehicle you can throw at it, including larger types such as RVs and even some commercial equipment. We really do wish that they would try their hand at making some true car ramps, however. Despite the beefy qualities of these, they are not intended to support a full car being lifted up on them. As expected, construction consists of molds that are poured and hardened into the final shape. The rubber used appears to be higher quality than a lot of other brands on the market and doesn’t seem to scrape or chip as easily as some of the other competition. We like that there aren’t any glaring shortcuts taken in construction and it seems that YM decided to not skimp on the rubber, even internally. Being made of much thicker and denser rubber than a lot of other car chocks, these are somewhat heavier. This may make carrying and storing them a bit more challenging. However, YM has thankfully included handles on several of their car chocks which help in transporting and fastening them. In addition, there are some large serrations on the top of the chocks which greatly assist in “hugging” your tires and ensuring a good grip. Compared to a lot of the other rubber car chocks on the market these are a bit more expensive. This is to be expected given that you are getting a lot more rubber with these as well as a bump up in performance. Despite the higher asking price, YM car chocks are still much cheaper than most traditional car ramps and should be within most people’s budget. YM car chocks offer up a nice selection that varies in size and shape. That being said, they do seem to take a pretty standard approach of giving you a lot more rubber than most of the competition. This results in a product that is much tougher and stronger than a lot of other examples out there. Helpful user-friendly features such as handles and large serrations are a nice touch and the asking price, while higher, is still within reason. We do wish that they would add to the expansive car chock lineup with at least a couple of car ramps, however. 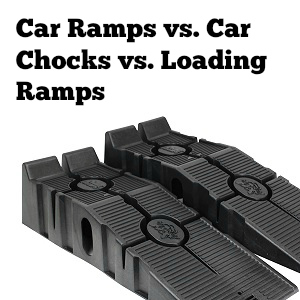 The difference between a car ramp, a car chock, and a loading ramp is a common source of confusion for many people we have spoken to. Because of this, we feel it is important to define each so that it will help you determine specifically which type of product you are looking for. A car chock is essentially a wedge that is designed to be slid into the side of a wheel, adding a significant level of resistance. By doing so, the likelihood of the wheel rotating (and ultimately the vehicle moving) is reduced tremendously. This can be helpful in particular on sloped surfaces where a failed e-brake could result in the vehicle rolling down the hill. Car chocks are very popular in the RV world as means to help secure an RV during use. It is very common for an RV to have to be parked on a surface that isn’t completely flat. While most RVs have the ability to be elevated or lowered to provide an even walking surface, it is still important to put a car chock behind the wheels for added security. Also, car chocks are often used in conjunction with car ramps or jack stands as added insurance in the case that the elevated wheels decided to roll off of the ramp or the jack stand to fall over. Car chocks are typically much smaller, lighter, and cheaper than car ramps. In addition, they are rarely made of metal and instead plastic or rubber are oftentimes used. A car ramp, as the name suggests, is a ramp that typically has an angled surface followed by a flat surface at the top. This allows a wheel to be rolled up the ramp and stopped on the flat surface. By doing so, the entire body of the car is elevated off of the ground. Car ramps can have multiple uses. The primary purpose of car ramps is to make it easier to access the underside of the car for maintenance work or for general inspection purposes. There are also some ramps that are curved and are advertised as being a good solution to tire warping for occasions where you have to store the car for long periods of time. Other applications include elevating for a car show or display purposes. A cousin to the traditional car ramp is a car loading ramp. This is a ramp that is intended to connect one area to another and provide a safe and secure path for tires to roll on. This can be designed for both transporting actual vehicles on it or also very transporting lighter objects such as ATVs, tractors, or simply supplies via a push car. Typically, car ramps and loading ramps are much larger, expensive, and less mobile than car chocks. They can also be made of various types of metal along with rubbers and plastic. As expected, the metal examples traditionally have the highest load ratings but there are some exceptions to this rule. Before you go out and purchase a new set of car ramps it is important to consider some important criteria that will help narrow down exactly what you should be looking for. While by no means all-encompassing, here are a few key factors you should think about. Car Ramp or Car Chock? We broke down the difference between a car ramp and a car chock above. Which one you should be looking for is up to your personal circumstances, but figuring this out is essential before making a purchase. If you plan on needing something that can elevate your car off of the ground then you will want to go with a car ramp. If you are simply looking for something that can help to keep your tires from rotating then a car chock is your answer. If you decide you need a car ramp, the next important step is to determine what sort of load rating you are after. Remember, not all car ramps are the same! They can vary greatly in how much weight they are designed to support. You need to find out how much the vehicle or object you are planning putting on the car ramp weighs. Curb weight of vehicles can typically be found inside the door on a posted sticker. We recommend finding a car ramp that is rated to a good bit higher than what your vehicle ways for the added safety factor associated with it. If you happen to have an extremely heavy vehicle or a semi-truck/tractor, your options will mostly be limited to heavy-duty metal car ramps. These are significantly more expensive but are extremely necessary in order for you to be safe while on the vehicle. A lighter vehicle such as most typical cars will have a wider range of choices including many in plastic and rubber. The slope of the ramp refers to how quickly the ramp increases in height relative to its length. This is important for multiple reasons. First, low profile vehicles have much less clearance and could potentially bottom out on a car ramp if its slope is too abrupt. Second, too steep of an incline may make it difficult for certain vehicles to get proper traction or have enough power to climb them (this can be a common issue in a vehicle that has to be pushed up a ramp instead of driven up by its own power). Finally, the less steep the ramp the longer it will be so space considerations can start to be a factor (we will get more into this below). Not all vehicle tires are the same width and in fact, can vary quite a bit. It is important to measure how wide your tires are and make sure that you only look at car ramps that can support your tire width. Typically, we like to find a car ramp that has a width that is several inches longer than the width of our tire so that it makes it much easier to drive up the ramp without risk of falling off the side. Most garages will be limited in how much space they have. While this usually isn’t an issue with car chocks, it can definitely play a role with car ramps. Some car ramps, particularly those with lower elevation angles, can be quite long. You need to measure your workspace and figure out the maximum length you have to work with. This one goes without saying, but it is essential to figure out your budget before shopping for ca ramps. Like many things, there is a rather wide budget range between the low-end and the high-end. Certain necessities may somewhat polarize your budget, however. For instance, if your truck is a 12,000-pound work vehicle then your choices of car ramps will be skewed towards the more expensive. However, if you have a standard 4,000-pound car then you may be able to get away with something more cheaper that can perform at acceptable levels. 1.6.1 Car Ramp or Car Chock?